Hotstart tank style heaters heat engine coolant to allow for easy engine start-up regardless of ambient temperature. 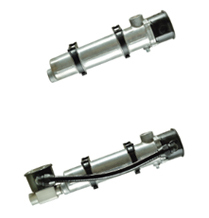 These heaters are designed to heat engines from 6L to 25L displacement. The heaters are available with static and adjustable thermostats to accommodate specific heating needs and to reduce engine wear, allow quick start ups and reduced emissions. Hard-wire electrical connection, single phase. These pressure die-cast aluminum tank heaters are disigned to circulate coolant through engines ranging in size from 200 CID to 1650 CID. Wattage options range from 1500W - 5000W with various voltages available. These single phase heaters are designed for hard wire electrical connection using rigid or flexible conduit. All models are available with or without flow through thermostat assemblies. The Triton solution is more than the industry's highest quality generators. It's a complete package that includes compatible switches, trailers and other accessories. That is how our business helps power your business.